…….Mississippi River at 24th Street……. Rock Island grew from a village to a city because of a bridge – the first railroad bridge to cross the Mississippi River in 1853. We remain a community of bridges: big bridges, small bridges, old bridges, new bridges, fancy bridges, plain bridges. And there is one bridge that we often don’t even bother to call a bridge. But a century ago, as this postcard title states, it had a real name – the Sylvan Bridge. The postcard shows what look like construction shacks in the foreground beneath a bridge that is supported by six stone piers in two different shapes within Sylvan Slough, the north branch of the Mississippi River as it splits to go around Arsenal Island.. The Clock Tower building can be seen in the distance and railroad tracks are barely visible in the foreground. Although the postcard calls this a “new” Sylvan Bridge to Rock Island Arsenal, there has been a bridge in this location at the foot of 24th Street since Civil War days. In 1863, the Rock Island City Council, in an effort to link what they termed separated portions of the city, appropriated $8000 to build a wooden wagon bridge to the island. Rock Island County was asked to contribute another $5000 toward the bridge but objections arose. Moline residents countered that since there was already a good bridge between Moline and the island and, since, a new bridge would only benefit Rock Islanders, its cost should be fully borne by Rock Island. Others were concerned that the bridge would provide a route of escape for rebel prisoners confined on the island. However it was pointed out that there were already two railroad bridges, as well as the Moline dam and the Moline bridge which could carry escapees. And prisoners could walk over the ice in winter or wade through the shallow waters of Sylvan Slough in summer. Although some Davenporters were reported to be jealous, others praised the ‘liberality and energy” of Rock Island and said that the city deserved the benefits they would certainly reap from trading with Uncle Sam’s employees and the prisoners. Rock Island got its bridge built. It was placed over Wilson’s Island, a sandbar of 7 ½ acres just off the west end of the island. (The configuration of this end of the island has changed a great deal since the lock and dam was built in the early 1930s.) Access to the bridge was from 24th Street and 2nd Avenue. In 1866, the city sold the relatively new span to the federal government for $14,000. It was just in time — the cheap wood construction was already deteriorating. By 1867, one section had to be repaired. Finally, in March of 1868, an ice jam completely removed the bridge and also created major flooding in the area. For a while, the only connection between the city and the island was by a rope-drawn ferry. In autumn of 1868, the arsenal commander began work on a new bridge. It was to be 36 feet wide, rest on three stone piers, and (the three boat-shaped ones shown on the postcard) and to have an iron superstructure. Although located on the same site as the old bridge, it was longer, to provide a wider passage for flowing water (and ice). An 1889 birdseye map of Rock Island shows a four-section bridge with overhead trusses. The deck was apparently still wooden, as in 1893 a dropped cigar started a fire midway on the span. Since the nearest hydrant was 800 feet away at 3rd Avenue and 24th Street, the bridge was in danger of destruction once again. Some wags even suggested that “No Smoking” notices be posted. Over the years, there were many complaints about the busy railroad tracks that were located just off the Rock Island bridge entrance. Travel was frequently delayed from 10 minutes to ½ hour, and it was even suggested that railroads should arrange their crossing hours so as not to interfere with the public. The final solution? A viaduct! 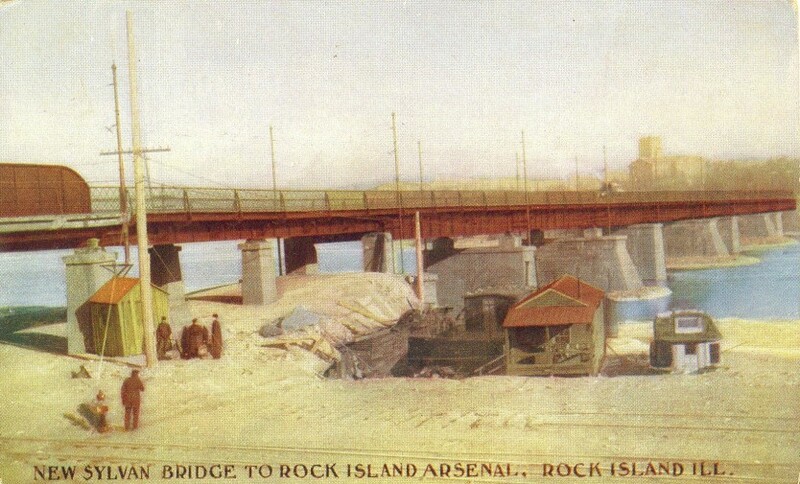 Around 1890, a proposal was made for a truss bridge 100 feet long that would raise the Rock Island end of the bridge and extend it over the tracks. At the same time, the tracks themselves were to be lowered by one foot. The extension meant access to 2nd Avenue had to be eliminated. After construction was completed in the early 1890s, people started calling the entire bridge a viaduct. This postcard, although published after 1900, appears to depict construction associated with the viaduct extension. The overhead superstructure is no longer there, and the bridge deck support has probably been reengineered to eliminate the wood decking. The No Smoking on Bridge signs could come down. The new design required additional support, so three new river piers were constructed. In the ensuing century, repairs have necessitated intermittent closings. Major construction in 1976 changed the access to the bridge as 1st Avenue was raised and extended to the bridge. That raising of the roadway eliminated access to 3rd Avenue. The new construction also extended the bridge itself toward Rock Island, thus making the city responsible for about 200 feet of the bridge entrance. In 2001, the bridge was closed for several months of reconstruction of the Rock Island owned portion. For over 100 years, we have commemorated construction of the railroad overpass by calling the entire bridge the Viaduct. But it’s time to renew the old name — the Sylvan Bridge. This is a great bridge over a beautiful Mississippi backwater. It deserves a name worthy of its history. Take a stroll or bike ride on the riverfront path to view the Sylvan Bridge from the same perspective shown on the postcard. What you think we should call this bridge? Special thanks to the volunteers at the Rock Island County Historical Society who maintain detailed clipping files on many subjects, including this bridge. This article by Diane Oestreich, slightly modified, originally appeared in the Moline Dispatch and Rock Island Argus on August 5, 2001.